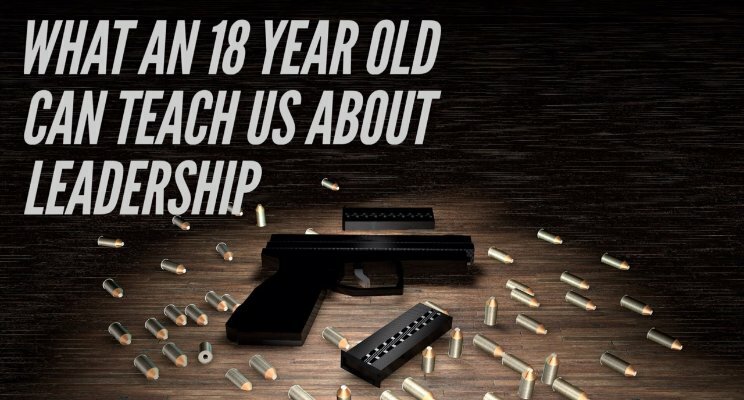 This post is spurred by watching a young woman speaking out about gun control. Emma Gonzalez, a senior at Marjory Stoneman Douglas High School, addressed a gun control rally on Saturday in Florida, days after a gunman entered her school and killed 17 people. Whatever your political beliefs and ideas around gun control, this is not a post about whether it is right or wrong. The purpose of this post is to take a deeper look at her actions and what we can learn and how it can help us to show up as better leaders and role models in the workplace, at home, and in the community. Think about the direction our world is going. The leaders in industry are leaving behind them a massive wake of nothing. They are in the crest of their careers and within the next two decades they will be looking for their exit strategies. That leaves who on the bench? Yes…. you guessed it. Us. There’s a gap. And we must fill the gap. We will be the new leaders. And we’ve got to be prepared to step into their shoes and take business and technology and education and politics forward. The tragedy is that not many people feel equipped to step into leadership today. The workplace doesn’t adequately train us. Education doesn’t adequately prepare us. That’s the #1 reason I ventured into training and disrupting that world- because I want to empower people to lead with more skill and more heart. Quite simply, the old way is no longer working anymore. When there are some people in the world- whether in business, on the global political stage, or within our home or community- who are doing things that are unethical, they don’t have our best interests at heart, they are not listening to us and asking what we want. They are not standing behind their business, we’ve got to speak up. I get that the fear of losing your job is a reality for many people… but let’s get some perspective. Previous generations such as the abolitionists, the suffragettes, the leaders of the civil rights movements, and countless others stood up to power when faced with injustice so that we could live with the freedom we have today. They lived under much harsher times than most of us will ever experience. Lives are being lost in mass shootings all around the country and at what point will we stop turning a blind eye and decide enough is enough? Millennials get so much bad rap for being fickle and not having loyalty, for wanting experiences instead of things, for being interested in “frivolous” pastimes like gaming and social media. But let’s turn this logic on its head. Maybe they have a different standard for what they should be loyal to. They are cause-driven and care deeply about making a difference – and this young woman’s speech demonstrates this. It also shows that this generation are incredibly loyal- but not in a quiet subservient way – they are loyal to the highest values of truth and non-violence. This generation has fire and dynamism and they have every right to care deeply and to speak boldly because this is their time and this is the world they are inheriting.. . the world that Gen X’s like myself and Baby Boomers that came before me have created and are handing to them. Millennials have every right to say ‘not on my watch’ and my question is why aren’t we also? Why are we so comfortable to sit back passively and believe we can’t create change if we are not in a position of power? It just takes one candle to light a room… and one candle to light a thousand more. Emma Gonzales took the mic and spoke up. And CNN listened. And now I challenge you…. where are you not speaking up in your life? If your boss or the company you work for is not doing things in alignment with your values and beliefs, how can you make your voice be heard? How will you speak truth to power? If you’ve got a kid, you would not hesitate to say no to them if you thought it was for their best and highest good. So why aren’t we exhibiting that same courage of conviction in the community and at work? How much is that inability to speak truth to power affecting your health, your relationships, your home life? Let’s stop turning a blind eye to the problems of the world because we are not directly affected by them or because we think change is beyond our reach. Skepticism is just an excuse for not helping and speaking up for a cause you believe in. Stand for something. I was interviewed on Fox News after the Las Vegas shooting. Just before I went on air, I was told not to mention gun control. They wanted guests to stay neutral and steared the interview away from questions that might lead me to take a political stance. I obliged and yet in the wake of recent events, I wonder, if the news channels provided a vehicle for more constructive dialogue that can raise public awareness, could incidents like this school shooting have been avoided? This same pattern is reflected in social media too. I see people that are afraid to speak up or comment on challenging political topics where there are no easy answers. Afraid someone will unfriend them for sharing anything other than a neutral opinion. Those that do speak up, often hate on the people that hold an opposing perspective and don’t provide the space to allow a dialogue to take place. I remember a story my Grandfather told me about Gandhi that speaks volumes about Gandhi’s character. General Smuts, the South African Prime Minister who was on the receiving end of Gandhi’s nonviolent campaign, confessed to Gandhi that he could deal with railway employees who were angry and hateful and said he did not mind using crushing violence against them. However, he said, he had a hard time dealing violently with Gandhi because although the Mahatma opposed his policies of discrimination, he always treated him with respect and consideration. During World War II when the British Government led by Sir Winston Churchill unleashed a campaign against Gandhi, General Smuts could not side with Churchill in saying anything bad about Gandhi. So you see, it is possible to speak truth to power while respecting people that hold different opinions to us. Let’s stand against the action, not the person. Let’s use the power of our voice to affect change where it matters. We owe it to ourselves. We owe it to our kids who are inheriting the world we have created. We owe it to the everyday folks that fill our history books; the folks who walked the hard path and stood up to power when faced with injustice so that we could live with the freedom we have today. I applaud this young woman at the rally for standing up and speaking without fear, or possibly more accurately, speaking despite her fear. I applaud this young woman for doing her due diligence and knowing her numbers so that millions listened and took her words to heart. I applaud this young woman for prioritizing the lives of her classmates and all kids and adults around the country who do not deserve to be at the receiving end of a senseless act of violence. If this is a snapshot of the generation that is is soon to enter the workforce, they have my deepest respect and admiration for daring greatly. It’s a lesson we can all live by. Leena Patel is the CEO of Global Impact Systems, founder of Sandbox2Boardroom.com, and a leading expert on helping executive teams worldwide drive innovation and develop a culture of collaboration and inclusion. She draws from two decades experience as a woman-owned business owner to design and execute on innovation initiatives that capitalize on new business opportunities and secure a strategic market position. Leena and her team have worked with leading corporations in 16+ industries, advised CEOs and Senior Executives worldwide, delivered over 1000 seminars, and have been featured by leading media like NBC, Bloomberg, Fox News, ESPN, and many more.